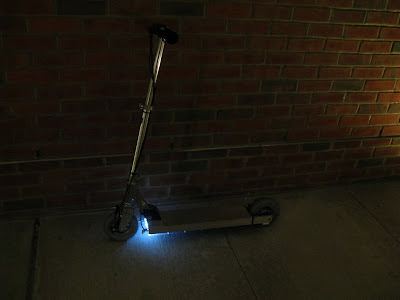 I now have two electric kick scooters, B.W.D. Scooter and Pneu Scooter. 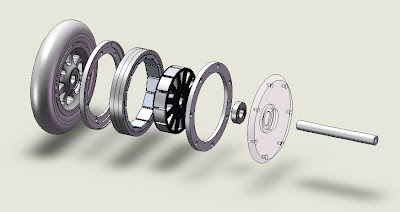 Each employs custom in-wheel motors (miniature hub motor technology pioneered by Charles Guan in Project RazEr), lithium-ion batteries, and custom brushless motor controllers. 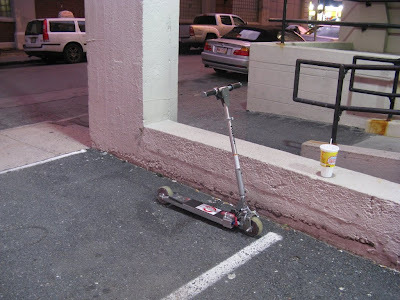 They're designed to be as close to normal-looking kick scooters as possible. Wheels: 6"x1.25" pneumatic casters. "Not for use above 3mph." 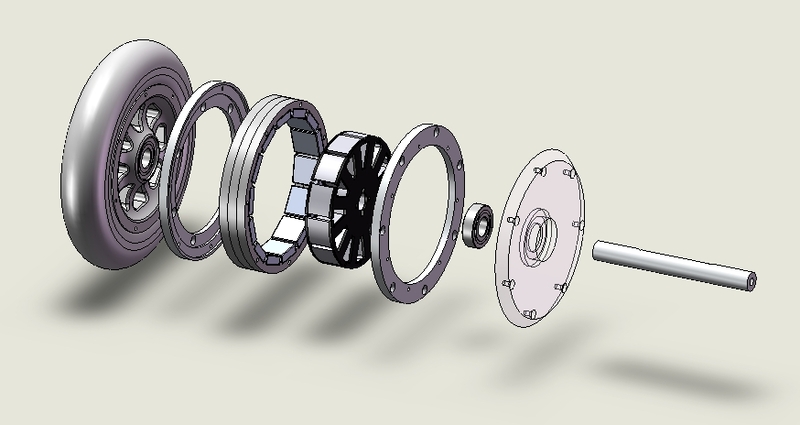 Motor: Custom 750W-peak brushless direct-drive rear wheel motor. Controller: 3ph v3.1 custom 40A controller. 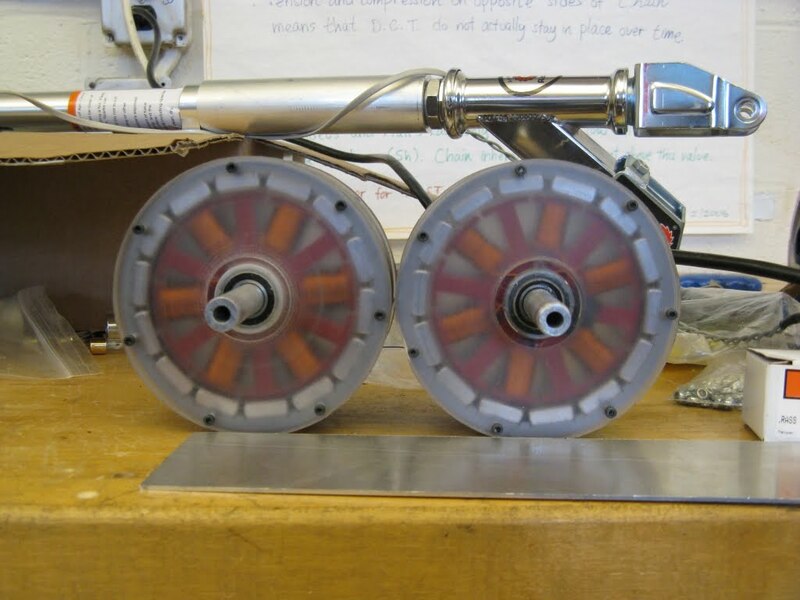 Pneu Scooter's motor is identical in 2D geometry to B.W.D, since it uses the same rotor and stator profile. (I had extra laminations.) It is shorter, but the decrease in length is more than offset by an increase in winding density. The result is a motor with about the same torque constant as B.W.D. 's front motor, but significantly more current capacity. As such, it needed a higher amperage controller, but with only a single channel. The 3ph v3.1 fits this bill. This version of the controller also plays MIDI, just because. Wheels: 5"x2" custom with 80A polyurethane tread. Motor: 2x custom 500W-peak brushless direct-drive wheel motors. The B.W.D. Scooter is the third of three vehicles created by the Edgerton Center Summer Engineering Workshop (2009 session). B.W.D stands for "Both Wheel Drive" or "Brushless Wheel Drive," depending on who you ask. It was inspired by Charles Guan's Project RazEr and extends the miniature hub motor technology to two-wheel drive. This was my first foray into custom motor design. 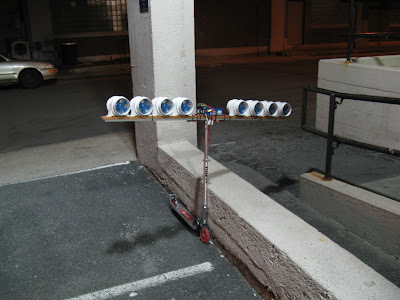 Two custom-built in-wheel brushless outrunner motors propel the B.W.D. scooter. The laminations were laser cut by project sponsor Proto Laminations Inc. The magnets are NdFeB, 14-pole. 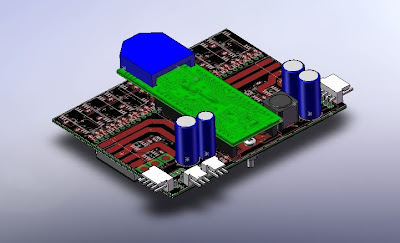 Here are the rough specifications when operated as brushless DC motors. The front motor is wound for more speed; the rear motor is wound for more torque. Power is sourced from a LiFePO4 battery pack hidden in the deck, made from 20 A123 26650 cells. These are the same cells that are used in DeWalt 36V power tools. In fact, the scooter packs is essentially two DeWalt 36V batteries in parallel. They give the scooter an effective range of about four miles, or "across campus a couple times." My major contribution to the project is the 3ph v2.1 controller. Originally designed as a replacement for the bulky but otherwise effective Kelly KBS line, it's a two channel, 1kW-per-channel brushless motor controller that fits with in the volume constraint of the scooter deck. Later work on the controller took it from brushless DC into the realm of sinusoidal AC field-oriented control, which made the scooter a lot quieter and probably more efficient. There is really no good reason for this. I built it to make Charles jealous because it looks more like an ekranoplan, specifically the KM, than his fanscooter. It uses cheap 12VDC in-line blowers, which are really sleeper EDFs that produce about 1lbf of thrust each. And yes, there is video to prove that it actually works.